Since we've chosen a six month furnished rental, we really don't need to bring much with us other than our toothbrushes and a change of underwear. Okay, there's going to be a few boxes of clothes as well and maybe a couple boxes with Christmas decorations because while not practical, who wouldn't want to decorate for a White Christmas in Colorado? Given small amount we're taking we'll just ship it out. Now the question is: what's the best way to get ourselves out there? 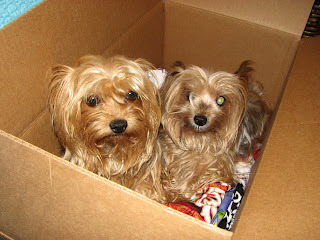 Should we ship the car by auto transport and fly out with our two yorkies? Or should we drive the 2000 miles? Currently I'm gathing info on what the actual dollar costs would be under either option. Pros: It's convenient, especially given the unpredictability of winter weather. Cons: It's expensive. Any way I crunch the numbers it will cost more to pay an auto transport company to ship the car, buy one-way tickets for two and two dogs, and then rent a car in Evergreen while we wait for my car to arrive. But maybe it's worth the extra cost? Pros: It's less expensive than the ship and fly alternative. We get to enjoy the scenery of a cross-country drive. Cons: Health and safety considerations for driving with an elderly person and two dogs for 2000 miles. This precludes long-haul drives, instead we'll make frequent stops to stretch our legs, which will mean that while Google Maps suggests we can make it in 1 day and 9 hours, we'll probably take 3 - 4 days. I'll be driving my H3 Hummer, not a Prius....I've estimated gas costs at $500.00. If you have any experience with a long distance move or thoughts you'd like to share, please leave a comment. Thanks! I would always do the drive. I enjoy seeing the sights and it seems so much less stressful and expensive than the alternative, but it would depend on how you feel about a road trip over so many days with mom and pups. An added benefit would be the stories you could share here as you made the long trek. I've done a ton of distance driving, back and forth across the US more than a few times as well as logging many miles driving from Scotland to London four times, but a Hummer makes it look a bit different. I'm kind of surprised that $500 will cover the gas...and I guess you''ll need pet friendly hotels too. Hmm....no wonder you're unsure.